Our unique wireless technology was developed by our parent company, HierComm, Inc., specifically to deliver high-speed Internet access in areas where cable, optical fiber and even DSL broadband connections are not available. HierComm’s Smart-RelayTM Network Architecture, with access points closer to the user provides our service areas with higher performance, near universal coverage, superior reliability and greater capacity than tower-only based networks. HierComm’s advanced wireless technology provides multi-megabits per second throughput performance for downloads and uploads (typically more than 3 mbps and often much faster). While other wireless services and satellites require a very clear “line of sight” between the subscriber and a distant tower or satellite, our Smart-Relay™ network allows us to go around obstructions, such as trees, buildings, hills and isolated locations providing near universal coverage to our service areas. HierComm Networks, LLC is the network operation arm of HierComm, Inc. Our mission is to help homes, businesses, and communities to realize the benefits of broadband wireless internet. Our focus is on rural and low population density regions. We are committed to providing Wireless Broadband Internet service with actual throughput (measured in megabits of data per second) that is comparable to service in most city and suburban areas at a competitive price. We also strive to serve our customers in a prompt, professional, and helpful way. A friendly local company, we are combining community spirit with the latest communications technology for even better rural living. View the HierComm Networks Brochure. Founded in 2005 in Hartland, Wisconsin HierComm Networks, LLC is a locally owned and operated wireless high speed internet service provider and the network operation arm of HierComm, Inc. Our mission is to help homes, businesses, and communities to realize the benefits of broadband wireless internet. Our focus is on rural and low population density regions. The word Hier is a German word meaning “here” or “local”. Many of our customers have told us we should rename our company and call it HigherComm or HigherComm Networks for the higher speeds we offer over the competition. Whether you call us HeirComm Networks, HigherComm, HighComm, HiComm, HierComm Networks or even Higher Networks we will not be offended. 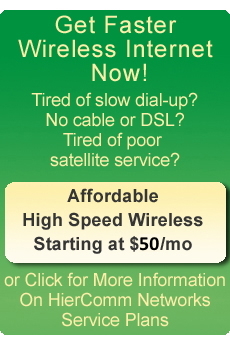 High Speed Local Broadband Wireless Internet is our purpose. HierComm’s Smart-RelayTM Network Architecture meets the technical and cost challenges of high-speed wireless Internet service over longer distances . Our technology “changes the game” for low-density rural and outlying suburban (or “rurban”) areas that typically have little or no access to true broadband Internet connections. We make broadband connection possible for our customers!